Last Friday I had the pleasure of joining Eric Wheeler of Positively Portland Walking Tours on another of his fabulous tours. 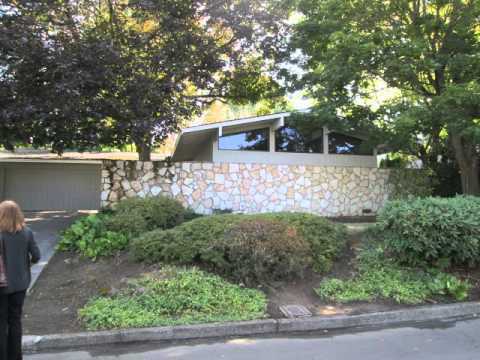 This time I visited the Reedwood neighborhood to take a look at some classic mid century modern homes (MCM’s). 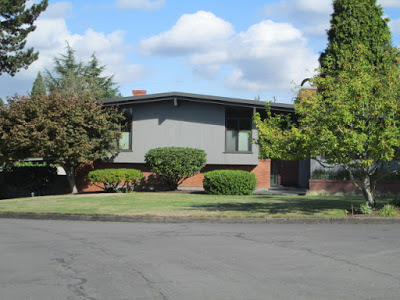 The Reedwood area is a little neighborhood just north of Reed College starting at SE Steele Street and west of Cesar E Chavez Boulevard. The cluster of MCM’s doesn’t extend even as far north as SE Holgate, or as far west as SE 26th. Reedwood sits on an area left undeveloped during the streetcar days in Portland, and it didn’t really come to life until the early 50’s. It’s one of the few collections of MCM’s close-in on the east side. The house styles are what I call very geometric, emphasizing horizontal more than vertical to look modern. As you walk through the neighborhood, it’s readily apparent the style was born to accommodate the automobile. You see attached garages, wide streets and no sidewalks! In fact, Eric informed us that one of the model homes in the area attracted 20,000 people to the open house! He had a photo showing a line up of cars. The irony is the neighborhood now has a pretty high bike score of 81, a walk score of 49, and transit score of 62.